Something old is new again. I have been a big fan of Paul Petagna and his wine for a number of years. Both under his “old” label Petagna Wines and the Sellicks Hill Wines label that Paul was making for his in laws. 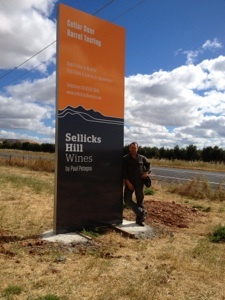 Now Paul has bought the rights to Sellicks Hill Wines and has opened a cellar door on the Main South Road property (the cellar door sign can be seen just north of the Victory Hotel). Paul’s wines are part of him – both are full of character and the wines are just so flavoursome. Interestingly the wines are also kept in barrel and bottle until they meet the standard before sale. As such the current releases are from between 2006 and 2009. By opening just one bottle you can share Paul’s passion for his wines and we should be glad for this passion. The Sellicks Hill vineyard was planted by Paul’s Father in Law and Paul himself – so he knows each and every vine. During winter I have seen him pruning the vines and even though he expresses his wish that somebody else would conduct the pruning, one can sense that deep down he fusses over each and every vine. The vineyard has Grenache and Shiraz with the Cabernet Sauvignon and Mourvedre used in the wines come from neighbouring vineyards so the wines are truly from Sellicks Hill. When I first saw this wine I was concerned as the wine had 3 years in oak and Grenache and oak do not always do well together. I should not have been concerned as this wine has turned out to be one of my favourite McLaren Vale red wines. It is drinking so well as Paul has done the cellaring for you. The wine shows black and red fruits with some fennel notes and minimal oak tannins. 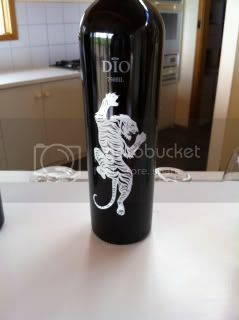 I saw this wine in barrel a number of times over the last couple of years and have been consistently impressed so it was not a surprise that Paul decided to bottle this as a straight Mourvedre (noting that the previous Dio was a GSM blend). Earthy, spicy and mid weight make this wine not only approachable but appealing to a number of different personal preferences. The classical Aussie blend that seemed to loose it’s way about 10 year ago as Australia went through the varietal phase. The blending of these 2 varieties allows the mid palate shortfall of Cabernet (this is a generalisation). I am glad this blend has begun to win back favour and this example is a beauty. There is the usual fair of plums and black current and I enjoy the mint character (which comes from a particular barrel of wine from a particular grower that is quite minty). Right up front I must say I do not like this label – I understand the significance of the playing card popular with the Italian community, but the label is terrible. 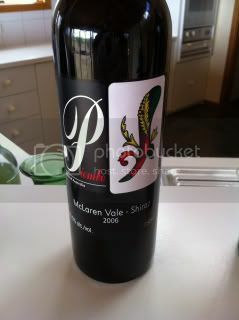 The good thing here is the wine is a cracker – just wonderful McLaren Vale Shiraz. Plums, spice complexity, liquorice and some chocolate as well. For me this is one of the better Shiraz wines around and it has been cellared for you. 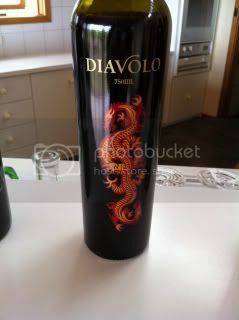 At the $40 mark I also think this is a steel – many wines of this ilk are well over $50. 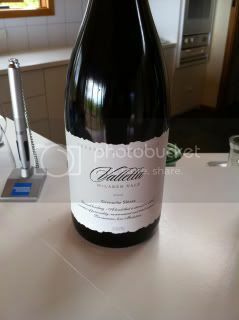 This entry was posted	on Sunday, January 12th, 2014 at 8:55 pm	and is filed under McLaren Vale, Wine. You can follow any responses to this entry through the RSS 2.0 feed. You can leave a response, or trackback from your own site.